Help Our Sister Sue Keep Breathing! Please allow us to introduce our sister, Sue Woodman Criswell, age 60, who is very ill. In the past Sue was a vivacious, outgoing, fun loving woman with a strong thirst for life and new adventures. When it comes to family she is selfless, loyal to a fault, and always putting others before herself. The last five years, Sue dedicated herself to the care of Mom and Mom’s fight with cancer and dementia. Now that Mom has passed, Sue could be able to live the rest life exploring all the opportunities that are ahead of her before she dies. She has a strong will for life and knows that there are more things she needs to do before the last breath. 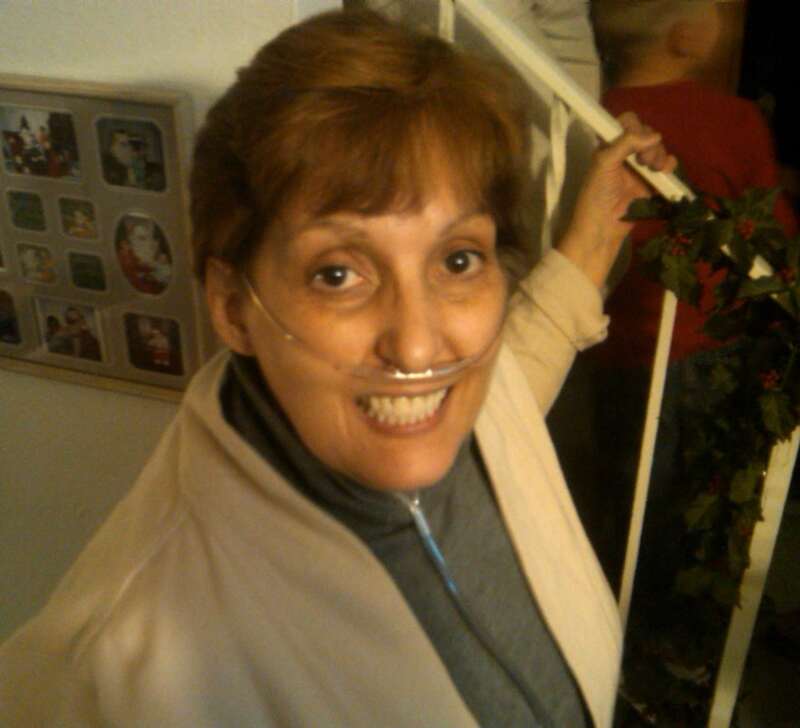 Unfortunately, Sue is fighting for her life; she needs a double lung transplant. Sue’s day to day tasks are hindered by the fact that her lungs cannot produce enough oxygen to sustain normal activities that you or I take for granted. On her last visit to her doctor, she was told that her lungs contain 70% of carbon dioxide, which she is physically unable to expel on her own. In 2014, Sue was placed on the lung transplant list. While this news has brought hope into the arena, she now is facing a major surgery and large expenses that will come with this life saving procedure. Insurance will cover some of these expenses; however it will still leave medication costs in excess of $2,500 a month, every month. There are also out-of-pocket medical expenses which cannot be determined at this time. To help with the financial burden of Sue’s uninsured expenses, a fundraising campaign in her honor has been established with HelpHOPELive, a trusted nonprofit organization that has been providing community-based fundraising guidance to patients and their families for more than 30 years. All donations are tax deductible, are held by HelpHOPELive in the Midwest/West Lung Transplant Fund and are administered by HelpHOPELive for transplant-related expenses only. Please consider making a contribution and give Sue hope for the future. Your support is critical to the overall success of Sue’s future. Please know that your contribution counts and will make a difference. On behalf of our family, we thank you in advance for your kind consideration. Hi everybody! I am still here and still waiting!? The only thing I can think of is I must be super special (or a Woodman) HA HA, we will wait and see thanks for all your support. well it has been a long time since I have updated my page. I have been moving and trying to get the new place ready for new lungs (positive attitude) anyway the new address is 5957 Flower St.
Hi everyone, just a short update on what is happening in my life right now. I have been on a Bi-Pap machine, sounds as weird as it looks, it is a bit smaller than a C-Pap and it has two levels of air flow,when I breath in I get a large amount of pressurized air and oxygen and when I breath out the air flow goes really low and seems to draw out more carbon monoxide that is stuck in my lungs. It seems that I have a new way to learn to sleep because if I lay wrong then the seal between my face and the mask will break and the burping sound makes my dog run for cover! Very entertaining!! Hi everyone, just a short note to let everyone know what is new. I finally got started on a Bi-Pap machine and it has made a world of difference when it comes to breathing. A little more energy and a little more distance from one end of a room to the next. WOW what a difference. Such a great update, Sue!! So happy for you!! And we sure know, Jim had something to do with this, right?! Blessings to the young woman who chose to be an organ donor! Prayers that things even out with the drugs needed for your ongoing recovery. I can not get you out of my mind. Thats a good thing because I can't stop chanting for you either. You are a warrior!